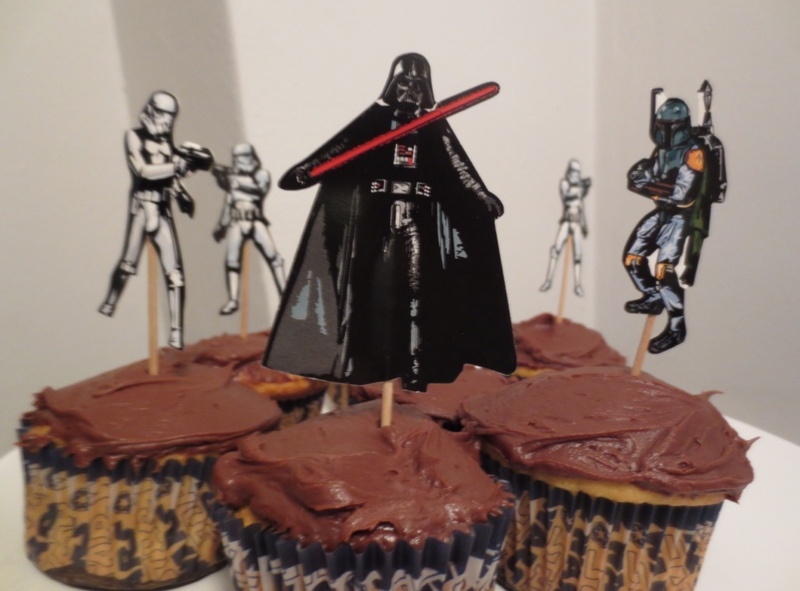 I don’t know how they spell perfection in your neck of the woods, but, if you ask me, nothing says Father’s Day more than a big old batch of Star Wars cupcakes! Greta and Mrs. Yeti had actually purchased this very cool Star Wars Cupcake Decorating Kit: Galactic Empire for Father’s Day (or maybe my birthday, I can’t remember) at Williams-Sonoma a while back and we just finally got around to using it this past weekend. Featuring environmentally-friendly soy ink — who says the dark side can’t be green? — on the Darth Vader and Stormtrooper cupcake liners and four different die-cut paper cupcake toppers (Darth Vader, Boba Fett and two different Stormtroopers) the set also comes in a super-cool display box that Star Wars nerds like me will enjoy looking at for hours! But best of all, these decorations are so cool that they make even store bought cupcakes made from a mix look totally homemade. That’s right, Daddy still likes his Duncan Hines or Pilsbury (whichever’s on sale…I ain’t fancy!) yellow cake mix and chocolate fudge frosting the best. So, happy belated Father’s Day to all the Star Wars geeks out there. Oh, and if you prefer your cupcakes to be decorated with characters from the good side of the Force, Williams-Sonoma also makes a kit featuring Luke, Leia, Han Solo and Yoda. So, whichever way you lean…enjoy!